This tutorial demonstrates how to use Parameterized Queries	in Decisions . Parameterized Queries is the best way to prevent SQL Injections . 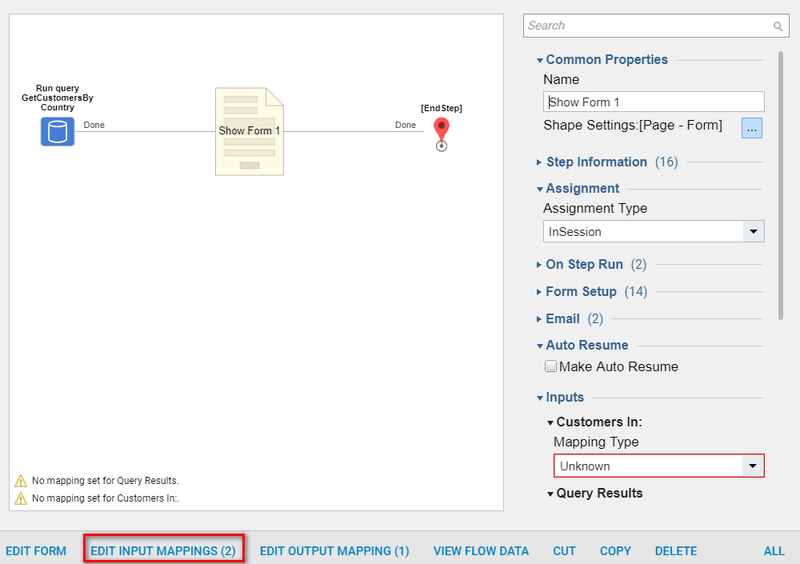 In these types of queries we define Parameters that become Variables when we run this Query in Workflow process. This technology makes our queries dynamic. In this example we are going to demonstrate how to create and use Parameterized Queries	in Decisions . We are going to create Parameterized Query forSQL Server. 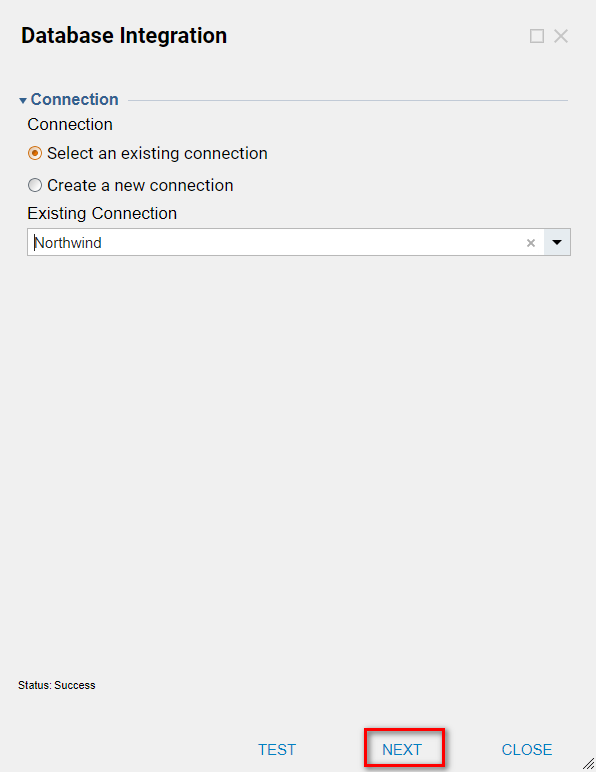 In this example we are going to query Customers	table in Northwind database. A Database Integration	window pops-up. In the Query Settings	we provide desirable Name	for the Query . 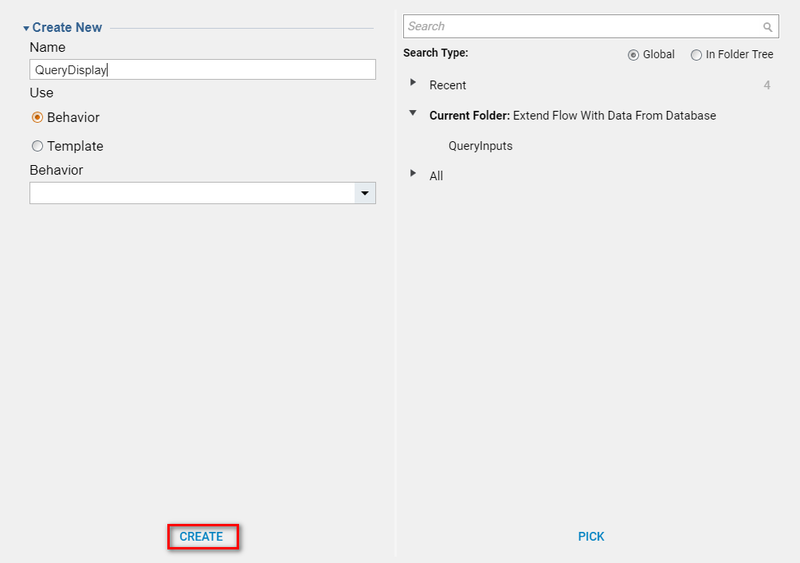 Next, if we need our Query to Return Data we checkReturn Data	check-box. Also, we can check Output Count	. Moreover, we can set Query Timeout (in seconds)	. 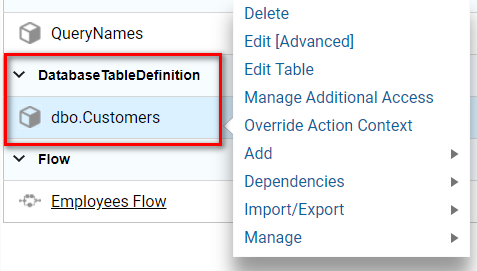 In the Query	window we define our Query statement. In this Example we are going toGet All Customers	by Country field. 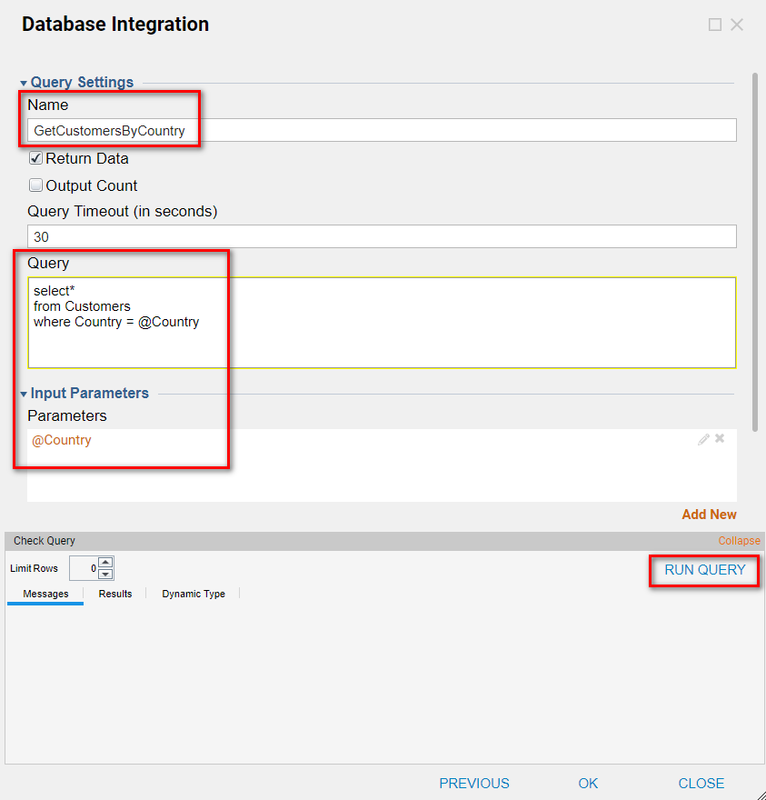 Notice	, last field of the Query definition states where Country = @Country	. In this example @Country	will be our Parameter	.‘@’	character defines a Parameter	for the SQL Server	query. Note: for different types of database Servers query parameter character may vary. 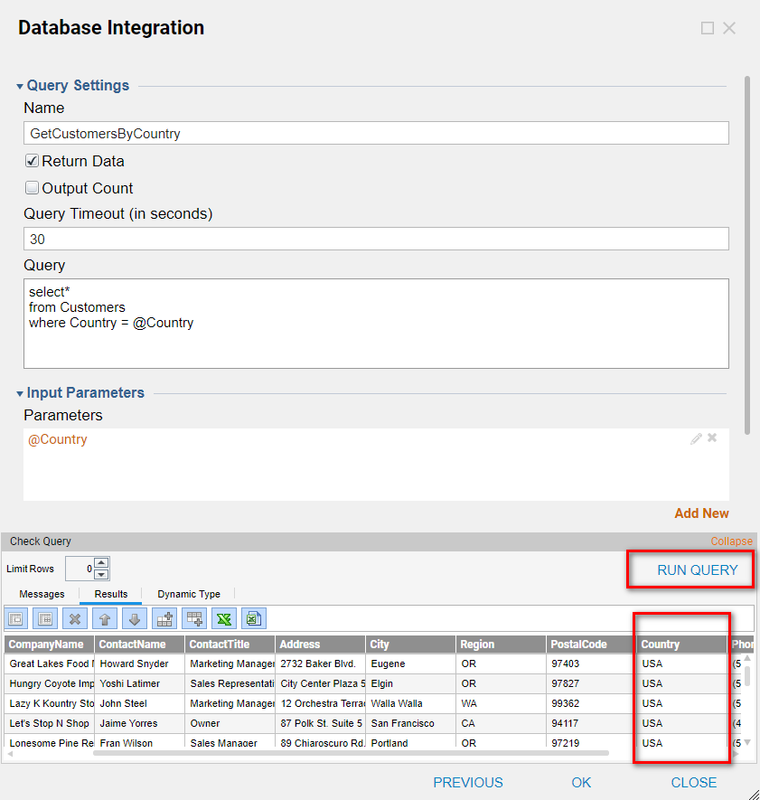 Then, we click Run Query	button to test our Query . We can see that our Query did not fail, but returned 0 Rows	. 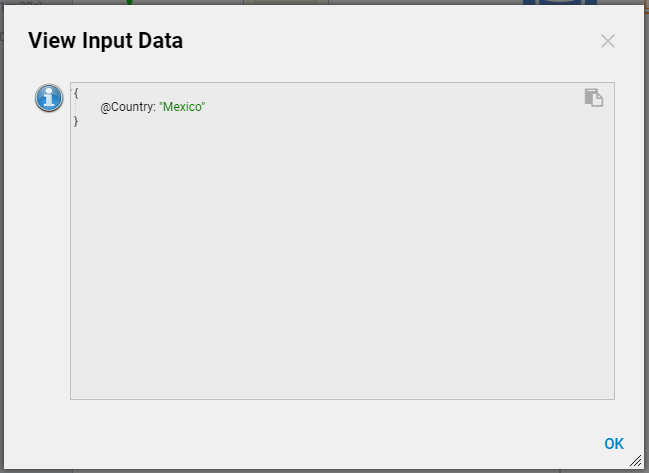 Also, we can see that System generated @Country	parameter in the Input Parameters	section. We can Edit	this Parameter by clicking pencil icon. In the Edit Parameters	window we can define Name, Default Value,	andType	for this Parameter . In this example we define Default Value	for parameter and click Ok	to save and continue. In this example we will leave Create Type	Return Data Option. Next, we Run Query	again. 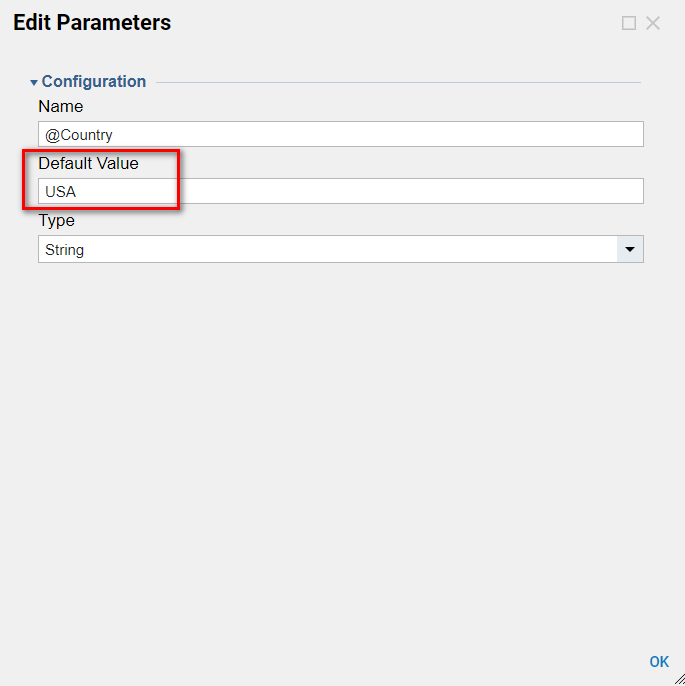 Because we defined Default Value	for our Parameter (USA) , our Query returns all Customers that located in USA . 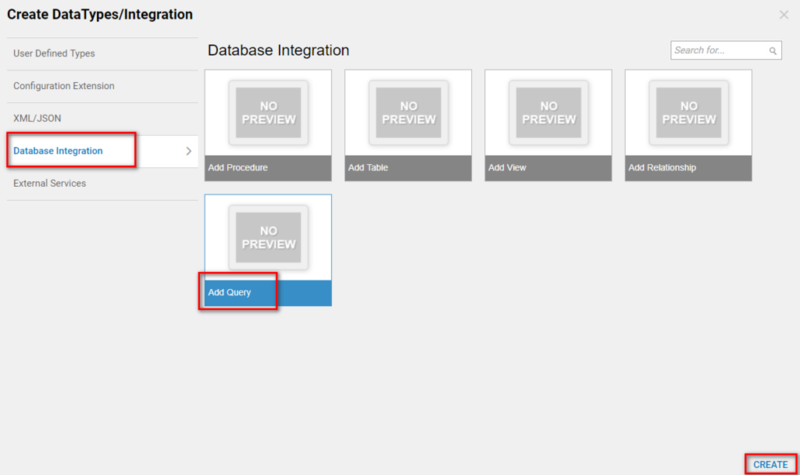 We can click Ok	to save and close Database Integration window. Back in the Northwind Folder	we can see our Query definition. 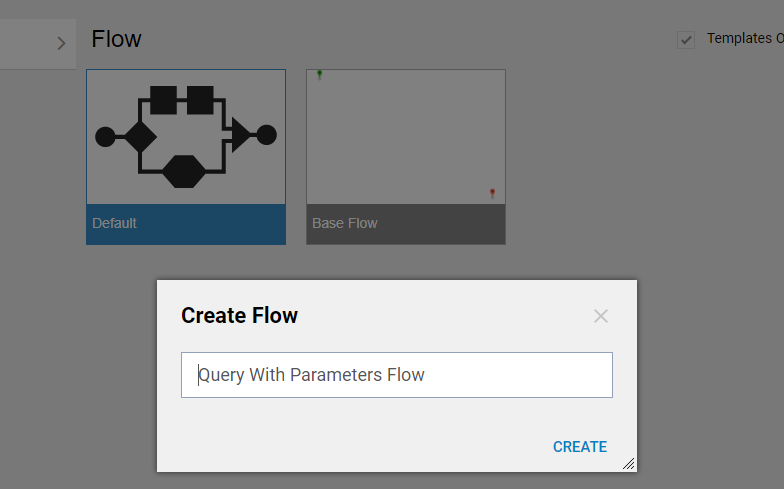 Next, we are going to demonstrate how to use this Parameterized Query in the Workflow	process. In the Designer Folder	we click Create Flow	on Folder Actions Panel. This Form is designed as following… It has a Label, Text Box	control (for User to input Country) , and Button	to submit the Form . When finished we can save and close Form Designer. 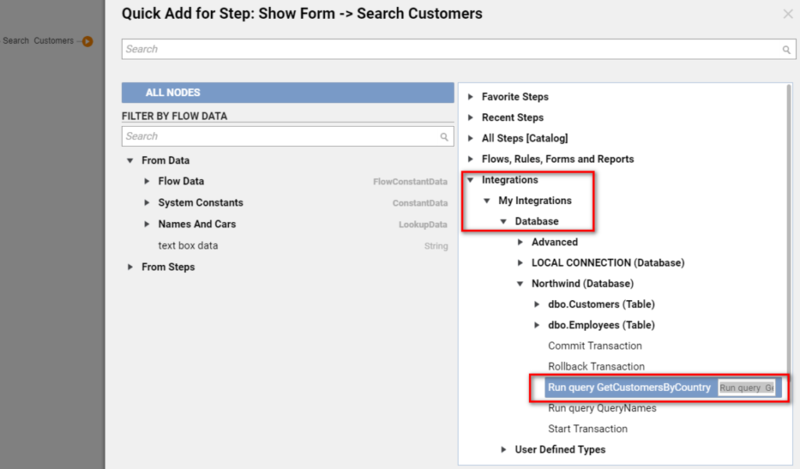 Back in the Flow Designer next to our Form step in the Flow we add Run query GetCustomersByCountry Step	from Integrations > My Integrations > Database Northwind (Database)	category. Then, for this step we Select Value of Country	output from the first Form in the Flow for the**@Country Input**	and Ignore Limit count Input . 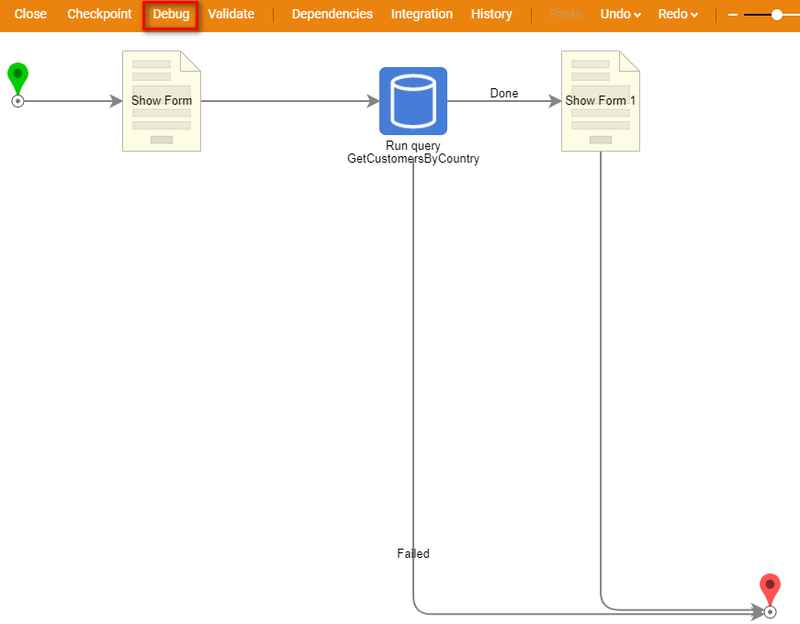 Next, we connect Failed	outcome from Run query GetCustomersByCountry Step	to the End Step	in our Flow . 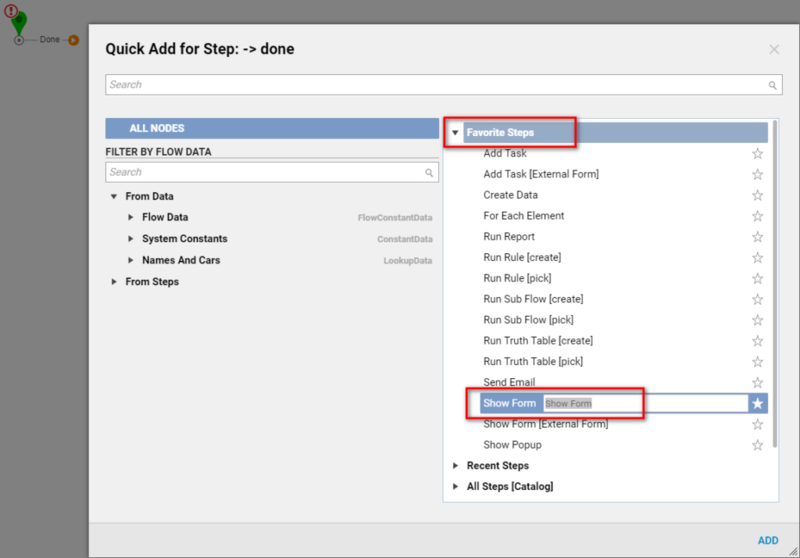 On the Done	outcome we add another Show Form Step	from Favorite Steps	category. 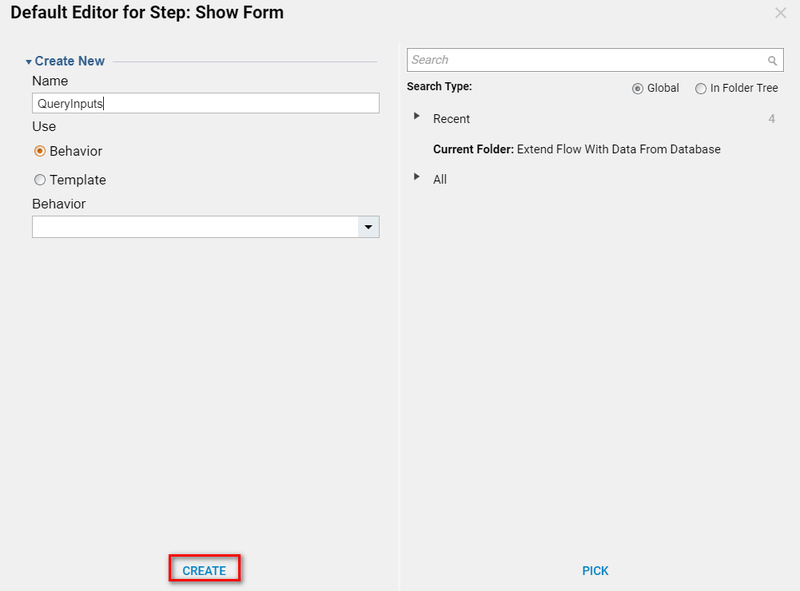 This Form is designed to display our Query Results . It has a Label:	Customers In and a Text Box	that displays User input from the previous Form in our Workflow . 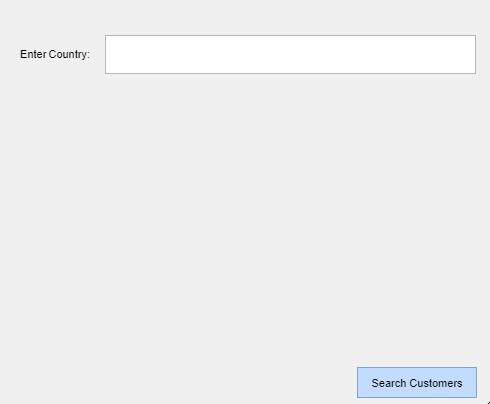 Query Results will be displayed in aData Grid	control with Northwind_Query_GetCustomersByCountry Type	. Finally, it has Button	control to submit and close Form . When finished, we can save and close Form Designer. Back in the Flow Designer we connect Done	outcome from Display Form Step to the End Step	in our Flow . 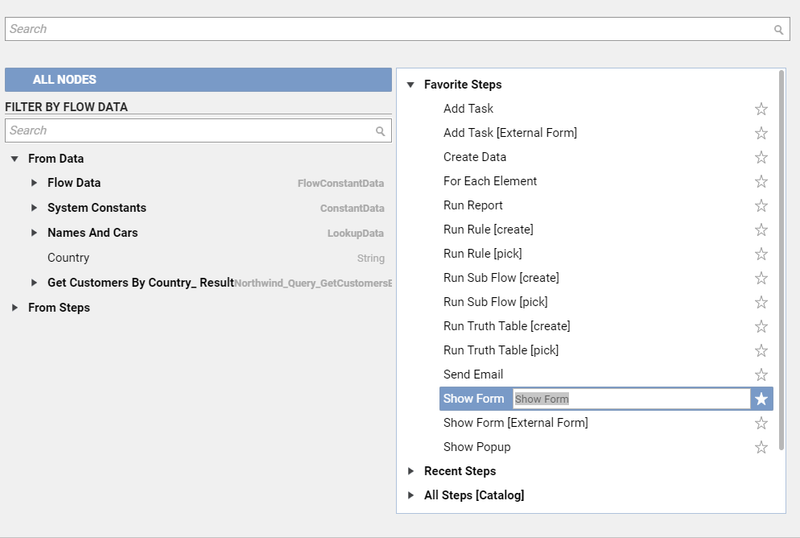 Then, we Edit Input Mapping	for Display Form Step. 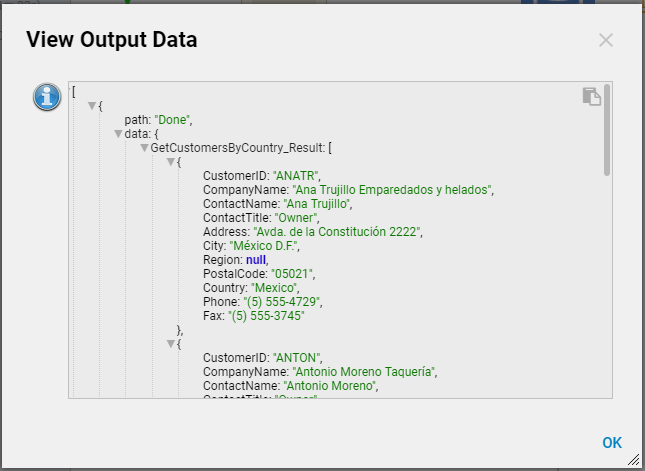 In the Mapping Editor we map Country	output from the first Form to Country (text box)	, and GetCustomersByCountry_Result	to Customers (Dynamic Data Grid control)	. Then, we can save and close Mapping Editor. This completes our Flow . 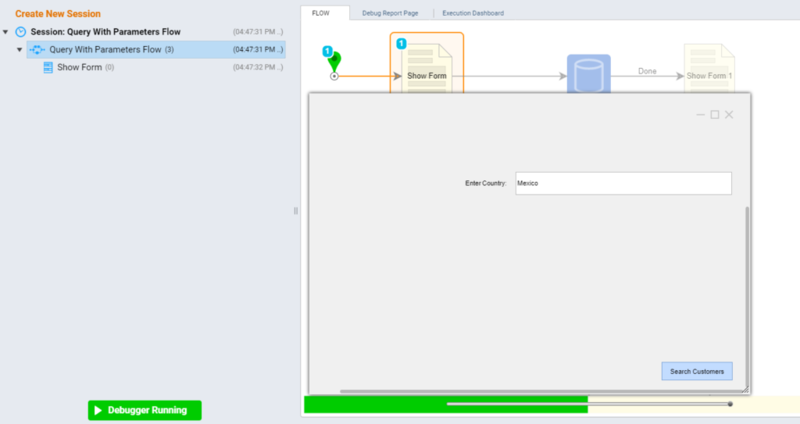 We can click Debug Flow	on top Panel of the Flow Designer. First Form opens in the Debugger	. We input Country	and click Search Customers. 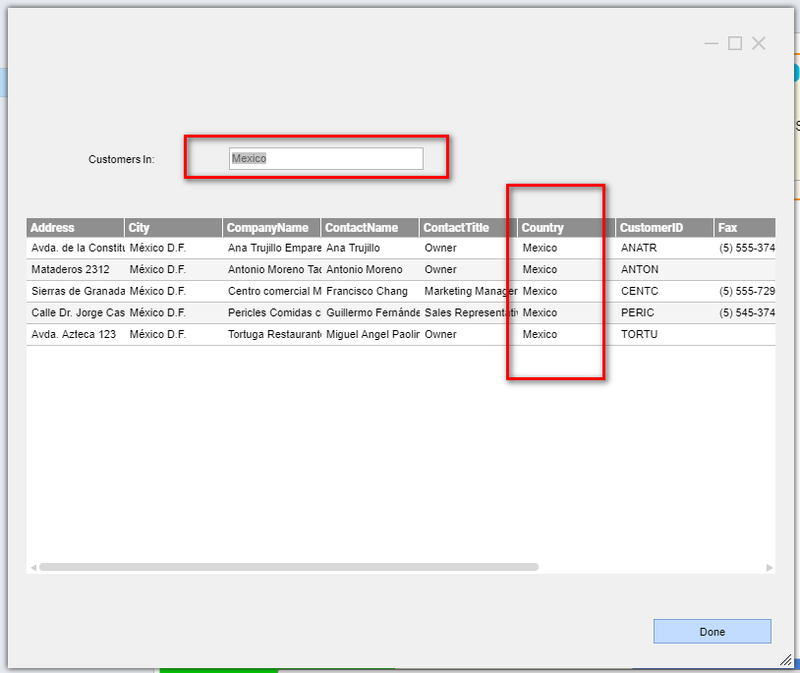 Second Form opens and displays all Customers from Mexico based on our Parameterized Query Result . We click Done	to close the Form and continue Flow execution.